I asked my son (a kindergarten student) what he thought of the comet, and he said "two carbon atoms, they stickeded together, then got excited and glowed green, while on the bottom sunlight is just reflecting off the dust atmosphere [tail and coma]. Thank you for visiting my blog entry." Put another way, the comet doesn't really show a tail in this photo, but the visible coma of the comet is not all made of the same stuff. 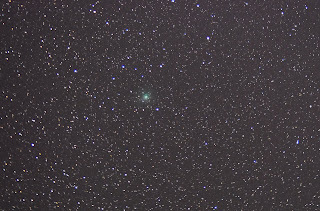 Diatomic carbon molecules fluoresce green and are largely in the upper half of the comet's atmosphere in this photo. In the bottom half, there is sunlight being reflected from dust particles (and in fact the nucleus itself) which is much whiter. This dust makes up one of the two tails a typical comet has, the dust tail that drags out behind the comet along the path of the orbit. The gas tail isn't really visible in this photo, but tends to point more or less directly away from the sun and is green in the case of Comet Wirtanen. For a better photo, look at SpaceWeather's comet photo gallery. While the comet was approaching Earth, the tail seems to have been hiding behind the head of the comet, more or less. Now the geometry has changed rapidly as it sped past Earth, and the dust tail is coming out of hiding. This is a tiny comet that just came close enough to be a relatively easy thing to see - which leads to one of the reasons my stars are short lines instead of points - the comet is what I was tracking, and it is moving, even in the short span of time I needed to take these photos. SpaceWeather.com is run by a public school teacher out of Bishop, California - the site maintains a collection of photos of interesting things in the sky submitted by folks around the world. This link goes to a movie of the comet moving among the background stars over roughly the same time I was taking my pictures. Comet Movie. This shows another object orbiting the sun moving against the starts as it moves away from Earth. 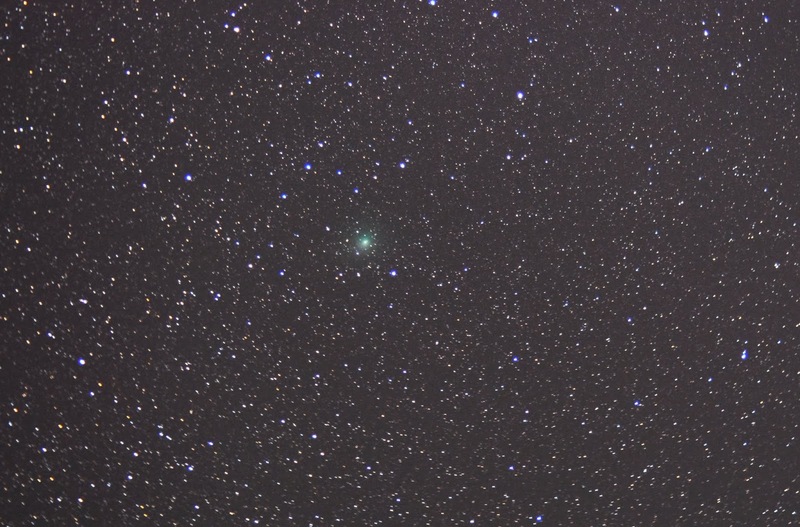 This was the 46th "periodic" comet discovered. In other words, it is in a stable orbit around the sun. This year it made a remarkably close - meaning several times the distance to the Moon - pass by the Earth. 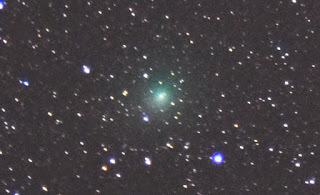 It is a little comet, yet even a little comet can be pretty and bright enough to see when it comes close. This picture is a stack of 12 photos taken literally by putting my camera on its back on the ground and taking 12 exposures of 5 seconds each, then stacking them. No fancy gear needed, in other words. 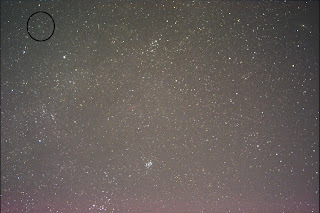 The comet is circled in the upper left, it is the faint fuzzy blob. Lots of folks have taken vastly better photos - this just happens to be mine. 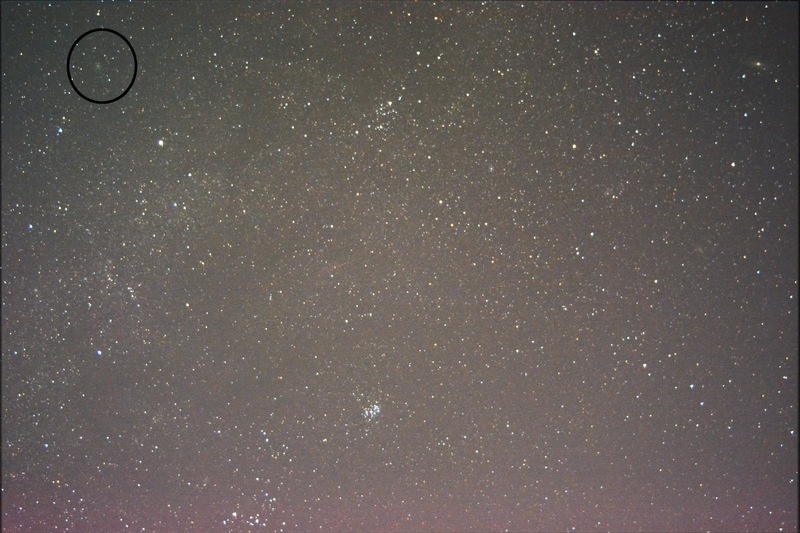 The Pleiades are in the lower center of the photo, and the Andromeda Galaxy in the upper right. 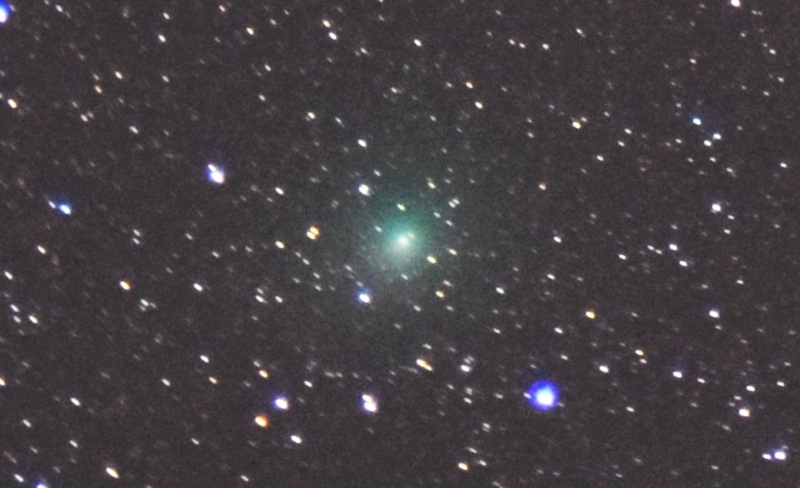 The neat thing about these sort of close-pass comets is that you can watch them move. Not quickly enough for the naked eye, but the comet had moved significantly between sunset and the time I took this picture, near eleven pm, at least it had moved its own diameter against the stars. When planetary distances are considered, there are relatively few chances we have to watch things other than the moon move this fast. It's that time of year! 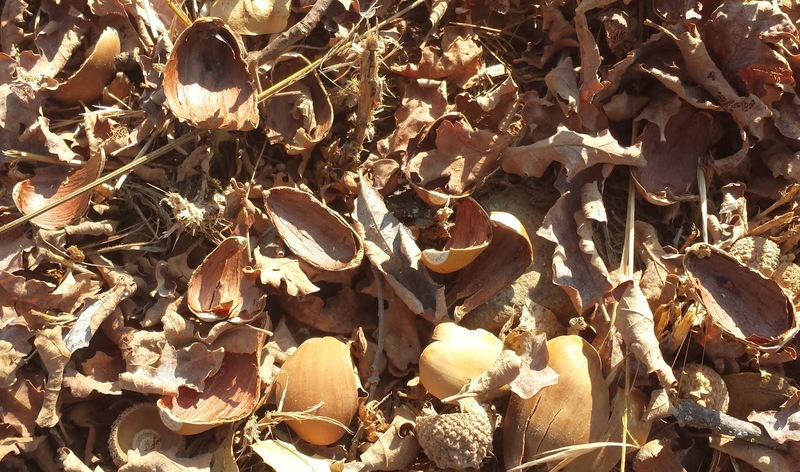 We've collected a lot of acorns, mostly from the Tanbark Oak (Lithocarpus densiflorus), time to make flour! If these were their close relatives, chestnuts, the process would be simple: shell, dry, grind. 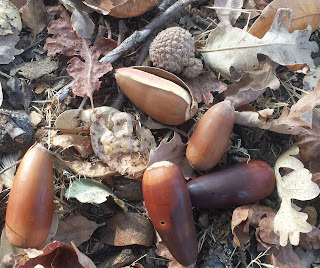 These acorns are full of tannins (the stuff that makes tea brown usually), so a few additional steps are involved. 1. 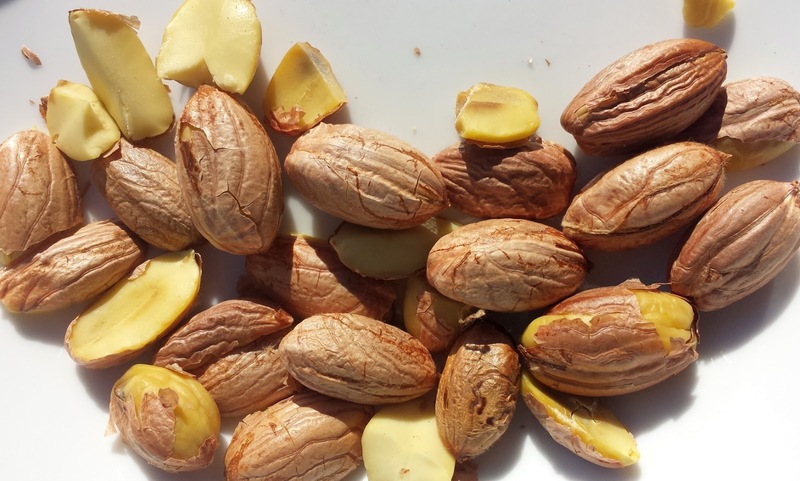 Dry the acorns as quickly as easily possible without heating them - we spread them in layers an inch or two deep on screens where there is good dry air circulation for a month or two. 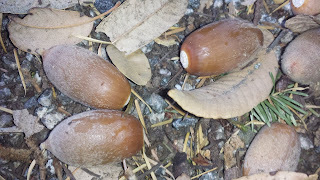 Acorns are susceptible to mold if stored moist for very long. 2. 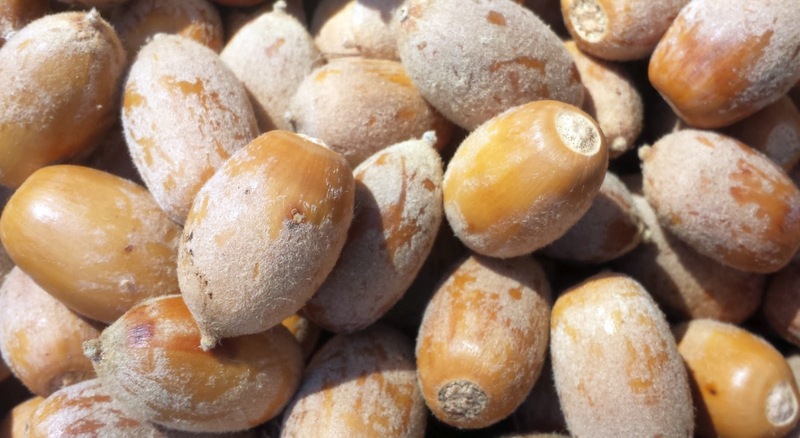 Do not heat acorns until you are completely finished with preparation of the edible flour and are preparing the final food item - heating these nuts or their flour early ruins the texture and prevents their "gluten-like" materials from showing their amazing properties. Step 1 - Start with shelling the acorns. I have built power machines for doing this, which are messy and I am still unconvinced they saved any time, net. What I do these days for small batches is simply sit at the table while chatting, watching programs, or sitting by the fireplace, and simply shell them by hand using a basic nut cracker. There are several approaches, cracking at the cap end (the white oval is at this end) seems to work best for me, though others have good success putting the nut longwise into the nut cracker. Experiment and find what works for you. 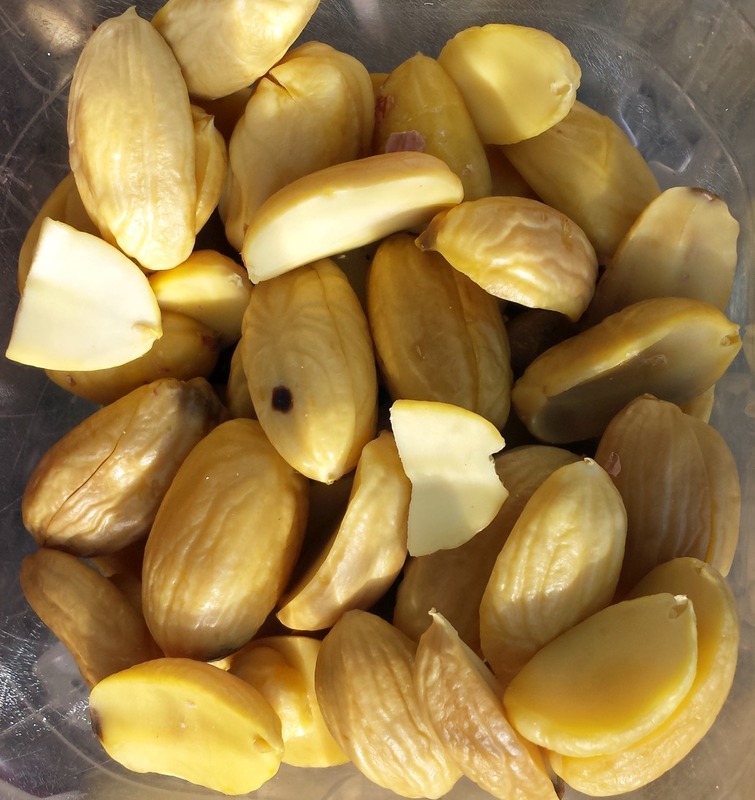 Discard any nuts that are moldy, darkened, contain bugs, or otherwise look "off". 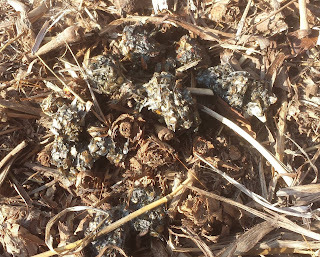 The shells and discarded nuts we use as mulch in the garden, they do compost given a bit of time. Shelled acorns for Tanoak acorns look like this, note that not all acorns will have the papery husks. 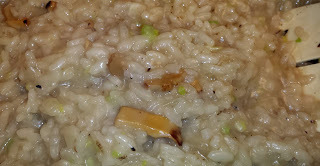 Step 2 - Remove the husks. Not all acorns have these, so if you have exposed nut meats right after shelling, skip this part. This step is optional - it doesn't seem to be too much of a problem (or even frankly detectable) if the husks are ground with the nuts, I just do this because if the nuts are dry the husks generally fall off easily and it makes examination of the nuts to see if there are hidden bad spots much easier. If the nuts are dry, the husks are just going to fall off by rubbing handfulls of acorns between your hands. 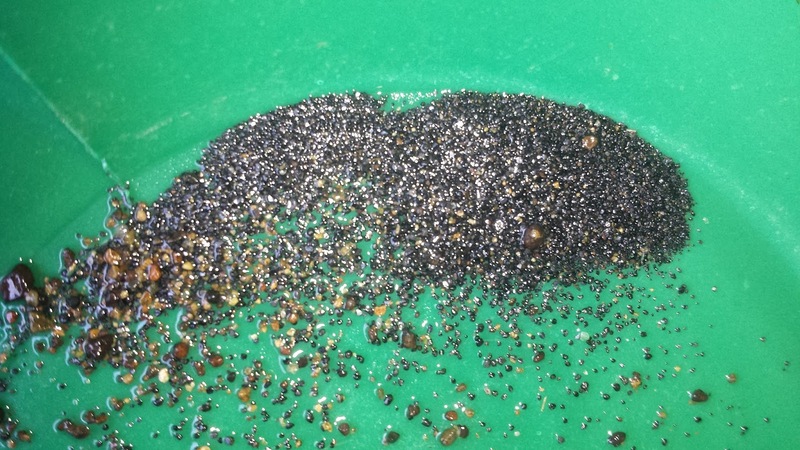 The chaff can then be blown off gently or the nuts picked out of the chaff. Discard any acorns with unusual coloration. Step 3 - Grind the acorns. 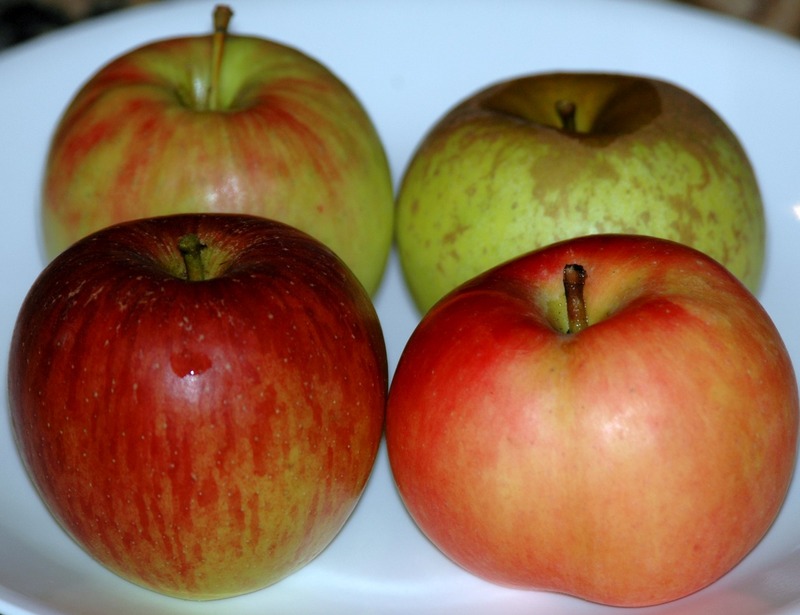 We put them in a kitchen blender and cover them with tap water until they are covered. Using a medium speed at first, and a high speed later, we grind the acorns into something with the consistency of a "smoothie". Step 4 - Leach the acorns. We lay out a set of old towels on a screen (lots of ways to do this), with a relatively smooth and fine weave kitchen towel as the top layer. By using some rolling of the edges of the towels a raised rim can be made that helps keep the acorn paste in the center of the towel. Use a spatula to spread the paste out so it is fairly uniformly thick. This is the acorn cake you will leach. Acorn meal exposed to air will darken slightly, which is not a problem. Shown below is an improvised leaching stack on a plastic garden chair. Note - the towels will be permanently stained by this process. While there are several ways of leaching acorns, this is our preferred one when we have cold weather and a suitable protected outside place to do the leaching. 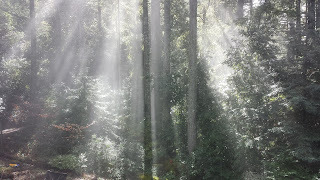 We put a Dramm Fogg-It seedling nozzle on the end of a hose and aim it from a distance at the cake, so that the mist falls evenly over the entire surface of the acorn cake and slowly flows through. We like this method because it can produce great results overnight, most other methods we have tried take several days in the refrigerator. Every few hours taste the water dripping out of the bottom of the cloth. If it has no bitterness, the leaching may be done. Taste the wet acorn cake to be sure - it should not be bitter. 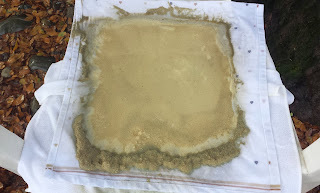 When this stage is reached the leaching is complete and it is time to dry the acorn cake. Step 5 - Dry the acorn cake. We allow the wet cake to drip for half an hour, then carefully fold the towel corners over the cake. We take this and compress it between layers of dry, clean, rag towels. You can put a cinder block atop the stack or other weight that doesn't care about getting moist. 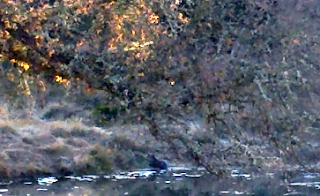 Let it dewater for an hour or so. If you can still squeeze water out by pinching some between your fingers, it needs another pressing with dry rag towels. Once this initial dewatering is done, we place it on a warm, dry (not hot!) place and set up a slow fan near it. Leave it on the towel - it will continue to wick water out of the cake and help the drying. When the surface of the cake is dry, fold the towel ontop of it and crush the cake into lumps. The middle should be moist still. Allow the lumps (break into half inch or smaller clumps) to dry to the touch, then crumble them up and repeat until the crumbles are dry. Continue the drying for another few hours just to be certain. Step 6 - Make "flour". In our case, we just put the dry acorn meal back into the blender and pulse it a few times to make a flour-like powder. This is now ready for use. Store in an airtight container in the freezer until ready to use. Asking my son what he would like people to know about the process, he replied "when do we get to make acorn chocolate chip cookies?". Up soon, Acorn Chocolate Chip Cookies! Cantharellus californicus - the Giant Golden California Chanterelle has made its usual appearance under oak trees within the coastal fog belt of Northern California. Today is the first day of December. Yesterday, we found several under Coastal Live Oaks near sea level - Quercus agrifolia - though they appear under several species of oaks in our area. In our yard they appear under Canyon Live Oaks, Quercus chrysolepis. I am suspicious that they can grow on Tanbark Oaks, yet lack proof. 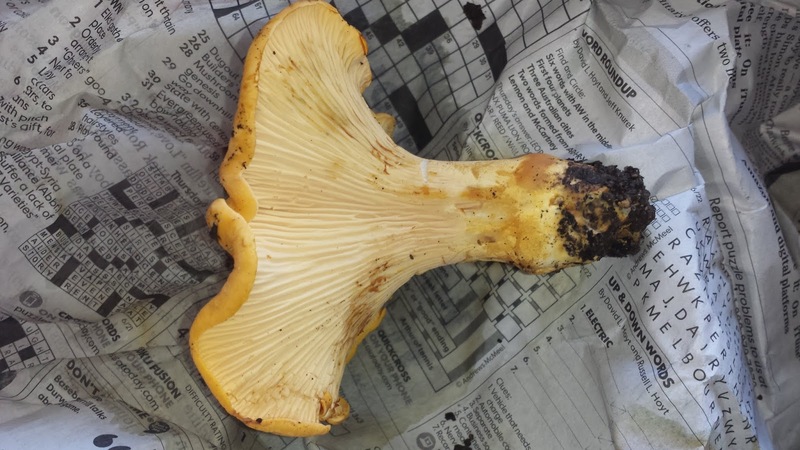 Please be aware there are poisonous mushrooms that can be mistaken for a Chanterelle, so don't start picking any edible mushrooms based on a book, a photo, or this blog. If you are interested, there is only one safe route to the practical knowledge - join a local mycological society and participate in some of the forays to become familiar with the local practices and rules. We are erratic members of the Mycological Society of San Francisco (mssf.org). 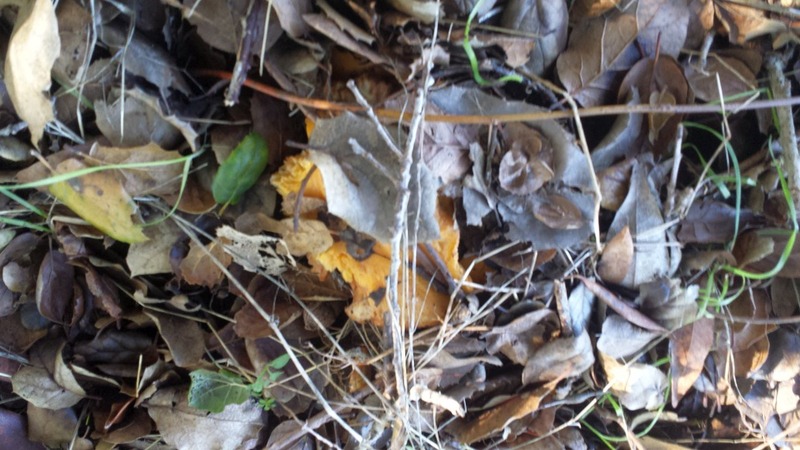 Good mycological societies can be found in many cities. While you might expect these societies to be full of scientists, generally there are many different constituencies - a large one of which often includes top local chefs! This species is the largest chanterelle species in the world. Finding one is often enough for a quality risotto for the whole family (one of our normal ways of fixing them), though they can be sliced and sauteed or fixed any number of ways. 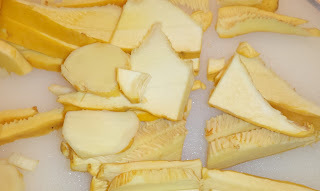 Avoid freezing or drying this type of mushroom, the results can be disappointing. There is joy in finding even just one of these. 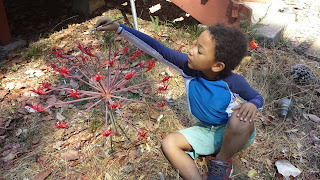 Asking my son about the one he found, he had this to say "but what about all the poison oak?" - he raises a good point, as Poison Oak often grows under these oaks (it is not an oak, but a low shrub or vine that causes horrible contact rashes, about a day after contact...). 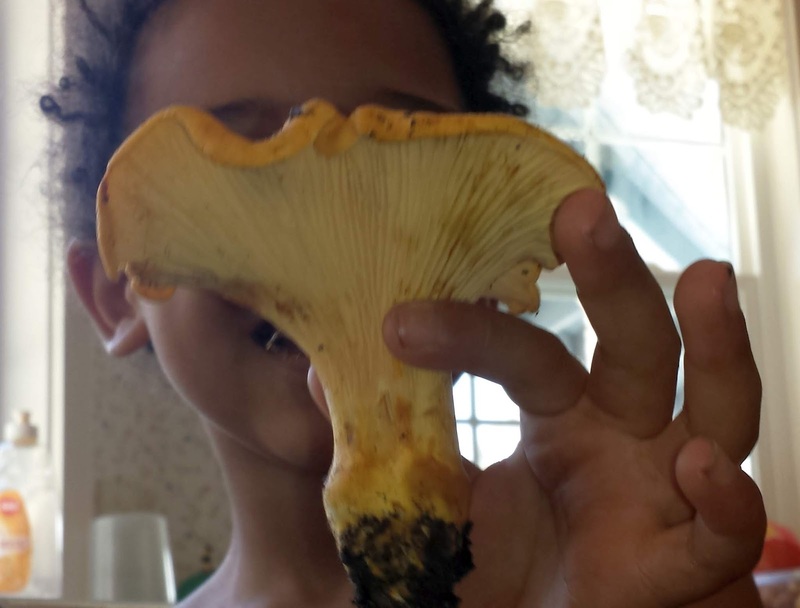 Consider this our invitation to you to experience the joys of mycology and mushroom hunting! 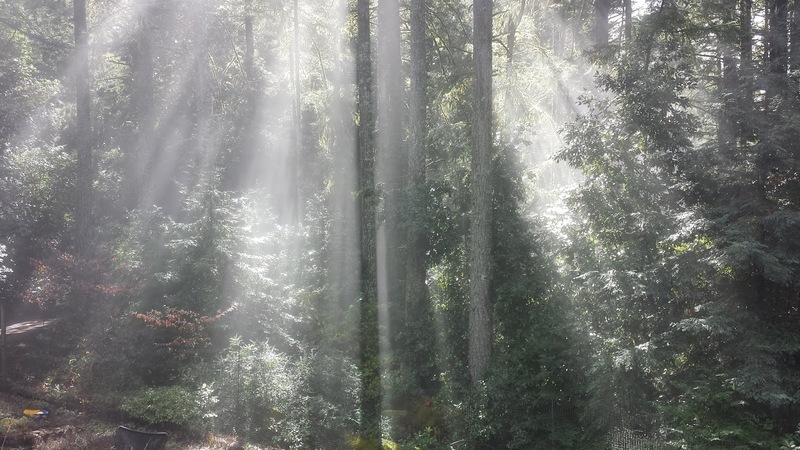 Our area (the Santa Cruz Mountains) often has rain before the end of October, though not this year. We haven't had real precipitation in six months or more now. What we have had is a tiny amount of fog drip. These are not good conditions for mushroom hunting. Even so, Armillaria mellea is a determined species. 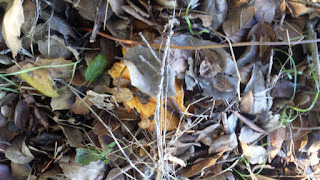 The Honey Mushroom connects to oak trees (admittedly it seems to be a pathogen more often than a symbiont), and is ubiquitous in Western Oak forests this time of year. This connection seems to give it access to water that other local mushrooms cannot access. 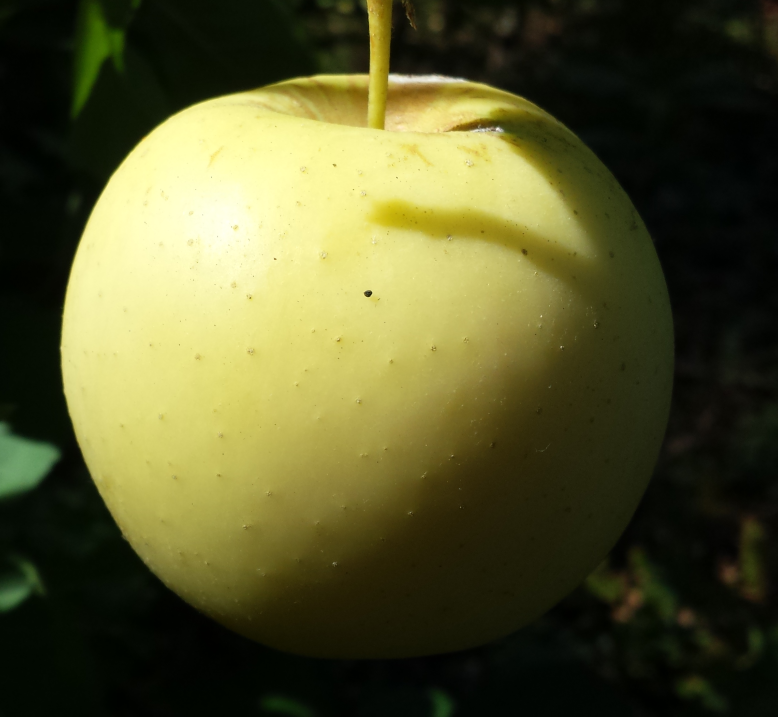 Here they are fruiting in our yard a few days ago! Notice that the caps are drying out even as they begin spore production. 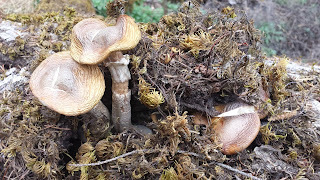 The cap on the right has cracked from desiccation in the unusually dry Fall air, but these still successfully fruited, pushing through the bark of a fallen tanoak log. The dry caps were bug-free, even though the stems had some insect damage. I rarely see mature Honey Mushrooms without damage to the caps from bugs. We're looking forward to the start of the main season with the rains, which may not begin until the start of December!